Taking this NetApp Storage training course will give you the advanced level knowledge and hands-on skills you need to configure, manage and maintain NetApp Clustered Data ONTAP, the 'Number One Storage Operating System in the world' as listed by IDC. The course is designed to give you a deep understanding of the theory of storage and all its functions and features. You'll gain the best practice knowledge of how to implement NetApp storage in a real world environment, and the hands-on skills to configure your system. The format of the course lessons is a full explanation of the topic theory, then a live demonstration in the lab where I show you the complete configuration using first the NetApp System Manager GUI and then the Command Line Interface. At over 20 hours long taking the course can seem daunting, but because it's laid out in a logical manner you can pick and choose the parts which are important to you. If you're a professional storage engineer who's going to be working on NetApp systems day to day, then skip the beginner sections and watch the rest. If you're new to storage, then just watch the theory part of the lessons and the GUI configuration sections you need. If later you need to know the best practice to configure a feature in your environment and want to see a step-by-step configuration example, you know it's all here. The course focuses on Clustered Data ONTAP 8.3, which is currently the most commonly deployed version. The topics covered apply to all versions of the operating system. A verifiable course certificate stating you have completed this advanced level NetApp Data ONTAP training will be provided on request. This will prove to potential future employers that you have the knowledge and skills necessary to be a real asset to their company. And if NetApp certification is your goal, you will find everything you need and more here to attain the NCDA NetApp Certified Data Administrator in Clustered Data ONTAP, the de facto standard in NetApp Storage certification. All of the slides shown in the course are included in the supplemental material. Q. 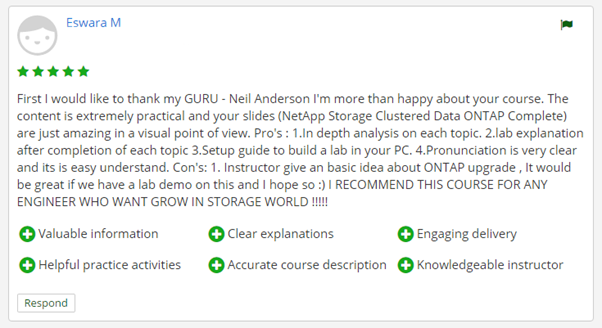 Who is the ‘NetApp Storage Clustered Data ONTAP Complete’ course for? Want to achieve an expert level in storage technology. The course teaches from a complete beginner level through to advanced knowledge of and configuration skills on NetApp systems. Have a NetApp ONTAP storage system and want a practical reference for understanding and configuring its features. Q. Is the course right for me? I could go on and on about why I think my course is the best NetApp training resource available, but instead I’ll let you hear from some of my students who’ve already enrolled. The course has achieved an absolutely stellar 4.98 out of 5 rating from student reviews. Q. Is there an easy way to pay for the course? Ask your manager at work if they can pay for it or if you can put it on expenses. Your workplace is used to paying $5000 to send you on a training course and they have to cover your absence for a week. My course includes way more content than you’d get in a classroom, it doesn’t take you away from your desk for a week… and it costs way less. No brainer. Q. Why would I take training from you? I am a full-time professional instructor who has been entrusted by NetApp since 2007 to develop and deliver training courses for their own engineers and partners. I have also designed multiple training courses for the largest service providers in Asia Pacific such as Verizon, Telstra, and the Australian National Broadband Network. I provide mentoring and support for my company's systems engineers as they deploy NetApp storage systems and I worked in the field for over ten years before focusing on passing my knowledge on to others. Q. How long do I have access to the course for? You have access to the course forever, your enrolment never expires. Q. What if I buy the course and realise it is not for me? The course comes with an unconditional risk-free 30 day money-back guarantee - that's my personal promise of your success. Thank you for taking the time to read about the course. I hope you now have enough motivation to get into the learning right away. If so, click the blue button at the top or bottom of the page to enroll and get started!